The Itty Bitty Kitty Committee: One of Our Favorite Flavors: ORANGE TABBY!!!! One of Our Favorite Flavors: ORANGE TABBY!!!! The cuteness continues! I've got an equally adorable kitten for you to meet today, and I'm going to advise you to take the same precautionary steps you took last night when we met our teeny tortie because this dude might just make your knees buckle. Because he is cute and he is ORANGE! 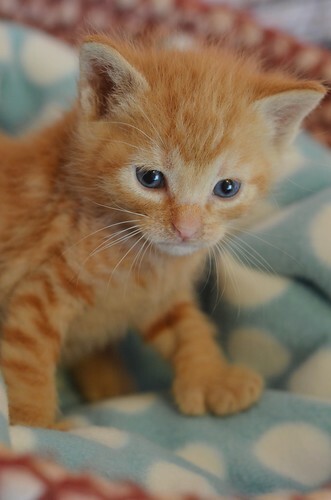 And I know we have many, MANY fans of orange kittens in this crowd, so he will make you weak. Not only is he orange, but he has EXTRA TOES! YES! WE'VE GOT A POLYDACTYL KITTEN!!! Is there anything better than a kitten that is both orange and polydactyl? I'm not sure that there is!!! That extra digit is going to come in "handy" when it's time to start answering the phones during our FUNdraiser. Please take note of his tiny white mask! Could he be a Superhero? Do we have a Kitten Crusader on our hands?? What is your superpower, dear thing? Do I need to stitch you a kitten cape? I need to catch my breath, how 'bout you? This really is a lot to take in. So let's all do that, but don't go too far because we've got ANOTHER cutie for you to meet today, and an alumni update, too! Smelling salts aren't going to cut it, my dear. I'm going to need the paddles over here! Oh my gosh. I bet he is claimed before the day is up. This is just crazy good! This litter is going to need a very special name! Orange kitties are my favorite! ❤ And polydactyl? Mitten kitten? Be still my beating heart! OMG... I looked at both the tortie and this orange boy within two minutes. I think I need to go home and recover! I'm sure your boss will understand! I vote "YES!" to the kitten cape!! The little white mask is so awesome! He must have a little cap! He must! He's wearing a fuzzy little catcher's mitt! Oh dear, an orange boy...be still my heart! 'K, today's a write-off now. That mask! I definitely think he needs a cape too. And you'll probably need to auction TWO names since he clearly has a secret identity! Holey cannoli! such a cutie! I know you gave fair warning, but I didn't listen! Aw, it's a super cute kitty! It's SuperToes! What a cutie pie! Kitten cape! Kitten cape! Kitten cape!